Reason for inclusion: This is widely considered one of the greatest rock films of all time, if not the greatest. So says the opening screen of The Last Waltz, Martin Scorcese’s documentation of The Band’s final performance on Thanksgiving Day, 1976. Set in the majestic Winterland Ballroom in San Francisco (also the site of the group’s very first concert), the film shows a good chunk of the actual concert, interspersed with brief interludes and interviews with band members. 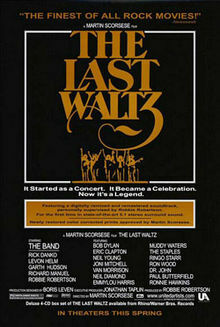 Going into The Last Waltz, I wasn’t sure what to expect. The Band is one of those groups that were wildly important in the 60s and 70s, but they somehow managed to ride the line of anonymity (not unlike their generic band name). Ask the average person about The Band and they may remember or recognize “The Weight“, but that’s probably the extent of their knowledge. I know that for many years, that was all I knew from them. No matter. This is a film that can be appreciated by music lovers of all kinds, whether fans of The Band or not. Their music stands the test of the time, and they are joined in their final concert by a number of familiar friends and well-known musicians. 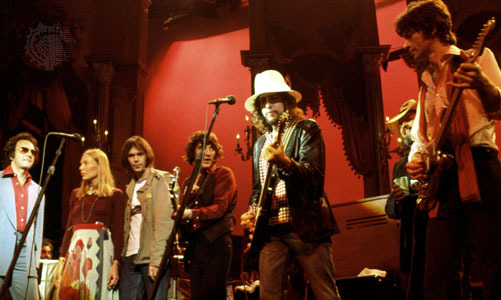 Just take a look at their list of special guests: Bob Dylan, Eric Clapton, Neil Young, Muddy Waters, Paul Butterfield, Neil Diamond, Emmylou Harris, Ronnie Hawkins, Dr. John, Van Morrison, Joni Mitchell, Ringo Star, Ronnie Wood, Bobby Charles, The Staple Singers. With such a wide variety of guests, naturally the music weaves in and out of different genres. Whether it’s blues, folk or just plain rock and roll, there’s something for everyone. Best of all, everyone on stage seems to be having the time of their life. There’s a sense of melancholy, to be sure, but most of the musicians are playing with a smile on their face. Now, this being a Scorcese picture, this isn’t a typical concert film. Scorcese went all out and turned this into a full-scale studio production with seven 35mm cameras, even employing some pretty great cinematographers to operate them. 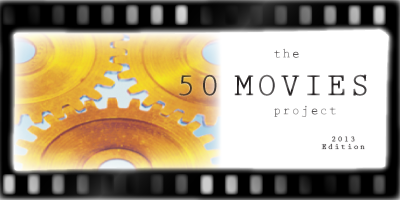 Michael Chapman (Raging Bull), Vilmos Zsigmond (Close Encounters of the Third Kind) and László Kovács (Easy Rider) are just a few of those attached to the project. The final product turned out to be a visually stunning concert, with frequent transitions between closeups of the different musicians. Some have complained that Scorcese focused too heavily on band member Robbie Robertson, but there are some great shots of all involved. 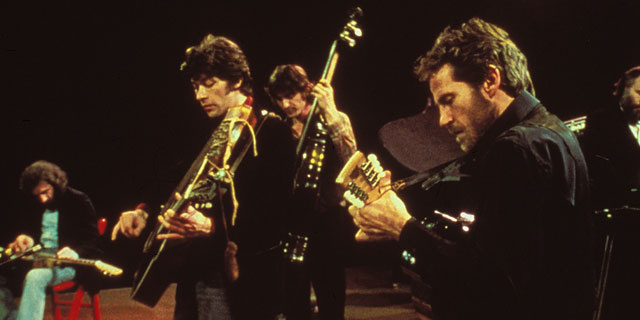 At its most basic, The Last Waltz is an amazing snapshot of its time. Is there a better congregation of 70s rock figures than in this film? There are many fun moments and performances, but seeing everyone involved come back on stage to play together one more time may be the best of all. The DVD includes a bonus cut of an improvised jam session as well, which is just as fun. If I were to have one complaint with the film, it would be that two of the song performances — “The Weight” with the Staple Singers and “Evangeline” with Emmylou Harris — were filmed on a sound stage, not at the actual concert. While these renditions are fantastic, it was odd to bounce between the two. Regardless, this is a great film, and Scorcese is absolutely right that it must be played LOUD. This is a fun, breezy two hours, and by the end of it I felt like I had just witnessed one hell of a show. I’ve cranked this up a few times on my system…sounds great on Blu-ray! I bet the Blu-ray is fantastic. I could see myself putting on this doc in the background from time to time. Great show. Nice review. I haven’t seen this but it sounds pretty good. Thanks. It’s well worth seeing if you’re a music fan at all. Excellent review of a true gem! Is there a more “Bang for the Buck” film in regard to music and talent? I don’t think so! Maybe ‘Woodstock’. Which Scorsese also help to edit, but I digress. The magic of The Band, is its members’ familiarity with more than one insturment. And their willingness to invite others to come play along, not just up front, but also in the background. The addition of a huge brass section elevates ‘The Night They Drove Old Dixie Down’ to heights never before achieved. While their connection to the guest performers. Especially Dylan (‘The Basement Tapes) and ladies in attendance is palpable and an homage to their past history. Does Scorsese spend too much time with Robbie Robertson? Yes, but the best tales come from Levon Helms and the rest of the performers. By all means. Play it Loud!!! Thanks, Jack! Play it loud, indeed. It was so much fun watching The Band on stage — whether they were at the forefront or acting as a backing band. So glad that Scorcese was able to be there and document this the way he did. An unforgettable night in music history. Now I must see Woodstock. Wow, that musical guests are awesome. I have not heard of this one Eric but sounds like it’s worth a look. If you’re a fan of any of these artists, you will love this, Ruth. So many great musicians at the top of their game. Great show, and Scorsese capture it fantastically. Exactly, buddy. Just an awesome concert. You know a movie’s good when it stays with you for months after you see it. That’s how The Last Waltz was for me. All of it was great, although I have a soft spot for the wild, out of control Caravan from Van Morrison. And since Levon Helm passed away, I’ve developed a soft spot for Ophelia and The Night They Drove Old Dixie Down. I don’t think I’ve ever seen a musician give more than Helm did performing those songs. 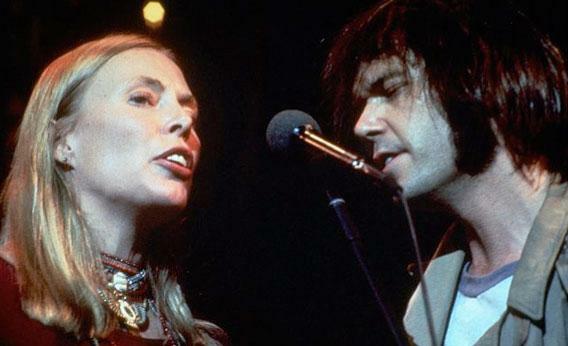 Oh man, yeah that Van Morrison performance was something else. Loved it. Did you catch the Grammys tribute to Levon Helm? It was kind of a rough rendition of “The Weight” overall, but I thought the gesture was nice.